Do find it a bit mad that this is a factor for people. I understand buying new skates you've never tried before as we all seek out the "perfect" skate. I understand trying a different mould to experiment with your skating. I can't fathom buying a skate because everyone-else-has-one. Especially given how most people (apart from with new moulds) know what works for them and what doesn't. It's worth watching his MCR section if you haven't already. Aside from the poor footage quality it gets really out of hand towards the end, some amazing tricks. Then moved to Sydney where he's been filming with Dom West since he got there. Lol... Why? Is it 2014? What do you mean by that? That Elliot isn't good anymore?! I'm tempted to put Respects and Thems head-to-head. Meanwhile, everyone is trying to get rid of their previously worshiped Valo skates, as fast as possible. AJ (allegedly) is sitting on a truck load of Valos no one wants to buy anymore, since they are no longer cool. 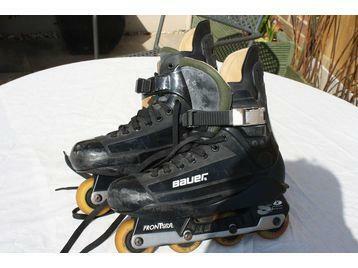 Rollerbladers sure are a funny bunch. How long until we get skinned Thems? If toe-bee bought all the Wizard frames he has firsthand then he's probably spent more money on blading than anyone else on this board in the last decade. Last edited by azrider; 16.07.2018, 14:59. "I swear dat woz the old Sabotage mold doh"…. Last edited by Dubjeeberplus; 16.07.2018, 12:10.